There are a number of ways to whiten teeth. The most popular method is using a home teeth whitening system that will whiten teeth dramatically. Since teeth whitening only works on natural tooth enamel, it is important to evaluate replacement of any old dental work. Replacement of any restorations will be done after bleaching so they will match the newly bleached teeth. This type of teeth whitening usually requires two visits. 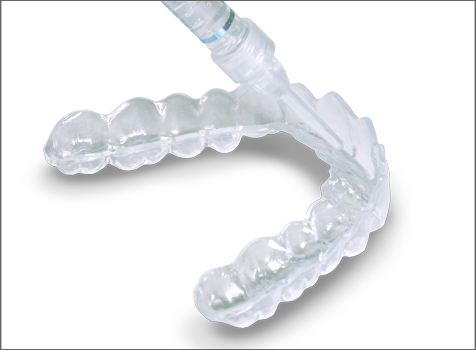 At the first appointment, impressions (molds) will be made of your teeth to fabricate custom, clear plastic trays. At your second appointment, you will try on the trays for proper fit, and adjustments will be made if necessary. The trays are worn with special whitening solution for 1-2 hours each day until the desired level of whitening is achieved. It is normal to experience tooth sensitivity during the time you are whitening your teeth, but it will subside shortly after you have stopped bleaching. Sinsational Smile is an in-office touch up whitening system that allows you to whiten your teeth several shades in just 20 minutes. With the use of a patented pre-filled silicone tray and a LED accelerating light to activate the whitening gel, we are able to help you achieve a brighter smile in less time while you comfortably relax in the chair. Included with the system is a whitening pen that helps you maintain your whiter smile at home. This whitening can even be scheduled with your cleaning appointment while you are already in the office!